After the little man’s Trick or Treat activity at playschool, he requested that we go to Jollibee and have lunch. He did not eat breakfast, after all, so I indulged him. The place was teeming with people, of course, given that it is lunchtime and one of the peak hours. There’s boisterous noise all over the place, coming from one happy diner to another, not to mention the lovely piped in music, probably created with an epiphone elitist and an orchestra, to provide everyone with an even jollier mood. I originally meant to order only the Chicken Value Meal comprised of 1-piece chicken with rice and a serving of creamy sopas on the side plus one huge pineapple for the little man, but then again, I saw the fast food’s current offering and did not pass up on the chance of getting the little man the cute Thor usb. So, yes, I also got one order of their Cheesy Bacon Mushroom Champ and boy it sure was a huge burger! This is the first time I ever tried this burger and I must say, I liked it. I love my good burgers even when I vowed not to eat too much meat for my health’s sake. Oh well, I indulge myself from time to time. I love the blend of the meaty bacon and the cheese! Just meaty delicious. The burger was too big I cannot finish it in one sitting, especially when i also had a regular fries and a glass of coke to go with it, not to mention the toddler’s leftover which I also had to finish, so I brought it home after only a couple of bites. 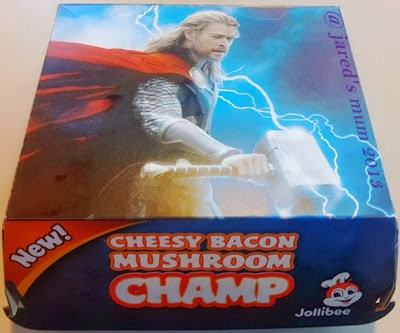 How was your Jollibee Cheesy Bacon Mushroom Champ experience? This entry was posted in food musings and tagged burgers, Jollibee on 31.October.2013 by admin. I have never tried this new burger from Jollibee and wondered what all the hype is all about. So one time my little man asked that we dine at his favorite fast food, I ordered one for me to have a taste. It was rather pricey for my taste at Php135, but boy the burger is packed with double burger patties, bacon strips, as well as a big pineapple slice, which I surmise, is where it got the name. The marriage of the meaty goodness and the tang of the pineapple slice is quite a delight to the palate! Needless to say, I loved the Amazing Aloha Burger. 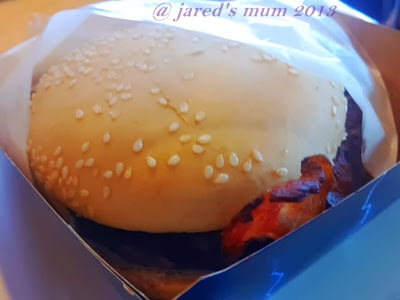 This entry was posted in food musings and tagged burgers, Jollibee on 30.July.2013 by admin.